Hmm. In New Zealand, they call a Hyundai a hyoonday. Interesting. Anyway. Brent found this ha-yoon-day commercial in which two babies hook up and drive to beach and surf. It's just weird enough to be good. Well, at least we think so. You watch it and let us know. To promote ESPN's Fantasy Football and to smack down Yahoo and CBS Sportsline, Boston's Arnold has created ESPN Fantasy Smack Cards which you can use to send your friends some smack talk. Who knows if it'll do anything for ESPN but it sure will be therapeutic for some who need to get their aggressions out. 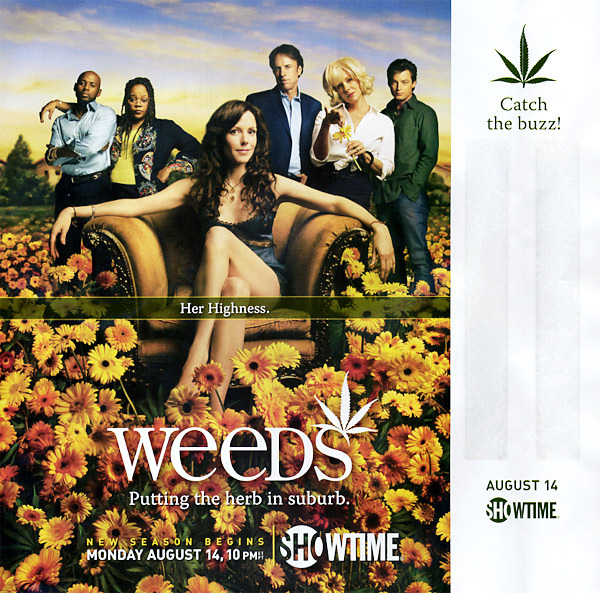 To drum up interest for its suburban mom as drug dealer comedy Weeds, Showtime is placing an insert in the August 24 issue of Rolling Stone with a scent strip that smells like, well, weed. Yummy. The show's good too. Apparently, behavioral marketing does work especially with women who are not petite. "Plus" sized (don't you love the polite terms we use to describe any body type other than a size 4?) clothing brand saw a 4,000 percent increase in online sales and a 200 percent increase in conversions after implementing behavioral targeting through NetPlus Marketing. These results were presented by NetPlus Markering Persident Denise Zimmerman at the recent eTail 2006 conference. You can hear the entire case study here. Once again, underwear retailer Freshpair stormed New York City's Times Sqaure with its annual booty and breast fest all in the name of reminding people they really should get rid of those skid-marked undies and ill-fitting bras and drop some coin for a...uh...fresh pair. Check out all the images and video over at YesButNoButYes. JWT Toronto has created an ambient (the word everyone outside the U.S. seems to use instead of guerilla) campaign for its client Purell, a hand sanitizer lotion. The campaign uses a simple but what would seem to be effective approach by placing stickers on magazines in doctors offices with copy such as "Thumbed through by sick people since September 2005" and "Gently sneezed on since October 2002." The stickers point to a website, washyourhands.tv, which explains the benefits of Purell. Nice work. Apparently in acknowledgment that every method to sell bubble gum has been done to death, Toronto-based agency Youthography chose to go with a decidedly different approach for its client Bubblicious. Celebrating the gum's pinkness, the spot gets a bit orgasmic with the stuff in that odd. nonsequitor sort of way. Print accompanies. Aside the having been able to take a dump in the time it took these virally-intended videos for Specialized Bicycles to load, they're actually quite funny. Created by Goodby, Silverstein & Partners, one video gleefully tears a cartoon character's intestines out as he rides the Stumpjumper mountain bike and the other mocks the O.J. Simpson aerial chase. Both good. Both funny. Go! Retire Your Tired Wardrobe And Go Shop! Creating a shopping mall campaign is usually right up there with creating a BRC for LCGC magazine but it looks like the folks over at Minneapolis-based Colle+McVoy had fun with this campaign for the area's Taubman Center shopping malls. The campiagn has a simple message: "Go." Go shopping. Poking fun at those who haven't shopped in years hence own a wardrobe worthy of a 50 year old trying to look fashionable as a chaperon at a high school dance, the campaign's message shame people into updating their wardrobe. The campaign will appear outside of the shopping malls and consist of customized signage, door hangers, Transtops, train wraps, hot air balloons, coffee cup wraps, dry cleaning bags, bowling clearing arms, restroom mirrors and a Website. Check out the creative here.